Sets A & B consists of some armored arm weapon packs for the Ryusoulgers to share. With 7 unique boxes per case, that breakdown suggests only a couple of duplicates per case. A full case retails for 5184 yen and is scheduled to ship in June 2019. Join in on our ongoing Ryuzoulger toy discussion in the thread linked below! 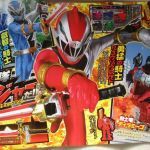 New Kishiryu Sentai RyuSoulger Magazine Scans Posted Online! 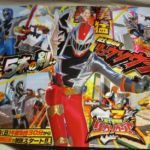 The latest round of magazine scans has come online, giving fans even more details about the upcoming Super Sentai series Kishiryu Sentai RyuSoulger! And many more RyuSouls await discovery! 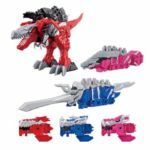 Not to be outdone, we also get some better images of the KishiRyu– the partner dinosaurs belonging to each RyuSoulger! The KishiRyu team consists of Red Tyramigo, Blue Triken, Pink Ankydoze, Green TigerLance & Black MiNeedle. Each one has unique combat abilities. RyuSoul Red is shown using another RyuSoul- the ChiaSoul on Tyramigo to shrink down his Kishiryu to the size of a human. The KishiRyus combine to form the great Mecha Knight, KishiRyuOh! The RyuSoulgers’ first combination will be Tyramigo, Triken and Ankydoze creating KishiRyuOh Three Knights! Then, when TigerLance is added to the group they will create KishiRyuOh TigerLance! This new form is much faster and has even greater swordsmanship. Finally, we are given a quick glimpse at the series’ villains- the Druidon and the monsters they will create, called Minusaurs. The villain character Creon will select human beings to transform into monsters, draining away their life energy. Kishiryu Sentai RyuSoulger officially begins March 17 2019! Stay tuned to TokuNation for any new details on this remarkable new series! New Kishiryu Sentai Ryusoulger Promotional Video Live! We’re still a month and a bit away from the premiere of the much anticipated Kishiryu Sentai Ryousoulger. In the meantime, a new promotional video went live on Bandai’s official YouTube channel. Kishiryu Sentai RyuSoulger Opening & Ending Previews Released! Another video from the Kishiryu Sentai RyuSoulger press conference has been posted online! In addition to some new moments with the cast discussing their personal favorite Super Sentai, this new video gives us a proper preview of the music for the 43rd Super Sentai series! *The opening theme, Kishiryu Sentai RyuSoulger performed by Tomohiro Hatano (begins at 4:19 timestamp). *The ending theme, Que Bom, RyuSoulger performed by Sister MAYO which also includes the traditional Super Sentai ending dance (begins at 6:14 timestamp). 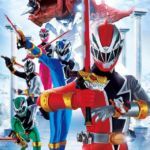 Kishiryu Sentai RyuSoulger begins on March 17 2019! Stay tuned to TokuNation for further details on this remarkable series! New Kishiryu Sentai RyuSoulger Preview & Music Details Released! Following the press conference that announced the cast members for the 43rd Super Sentai series Kishiryu Sentai RyuSoulger, a new preview has been released giving us our first proper look at this team in action! This stage performance gives us our first proper look at the RyuSoulger cast in action, along with some brief teases of the series’ henshin sequences and music (including the ending-dance). *The opening theme, Kishiryu Sentai RyuSoulger will be performed by singer Tomohiro Hatano who previously performed the opening to Uchu Sentai KyuRanger. *The ending theme Que Bom, RyuSoulger will be handled by the group Sister MAYO who previously performed the ending theme to Mahou Sentai MagiRanger. Kishiryu Sentai RyuSoulger officially begins March 17 2019! Feel free to join in our Ongoing RyuSoulger Discussion Thread to share your thoughts & fears about this remarkable new series! 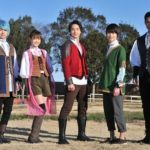 Meet the Cast of Kishiryu Sentai Ryusoulger! Kou, RyusoulRed played by actor Hayate Ichinose. Banba, RyusoulBlack played by actor Tatsuya Kishida and is the oldest of the group. And last but not least, Melt Ryusoul Blue portrayed by Keito Tsuna. Tyamigo, the dinosaur partner of Ryusoul Red will be voiced by Masaki Terasoma whose past roles include Kintaros from Kamen Rider Den -O and Shadow Moon of Kamen Rider Black fame. Kishiryu Sentai RyuSoulger DX KishiRyuOh Official Images Released! Some official images have been released for the first merchandise for the upcoming Super Sentai series, Kishiryu Sentai RyuSoulger! This is our best look yet at the series’ Mecha, KishiRyuOh! This Mecha starts off as Ryusoul Red’s personal KishiRyu partner, Tyramigo. Thanks to the power of a unique RyuSoul (the mysterious devices that power the RyuSoulgers, resembling dinosaur heads that transform into knights), Tyramigo is able to transform into the gigantic robotic knight KishiRyuOh! This DX release will include a special Red RyuSoul for collectors. As will all Super Sentai Mecha, true strength comes from combination! Uniting with the other KishiRyu creates brand new forms for KishiRyuOh. By combining with Ryusoul Pink’s Ankylose and Ryusoul Blue’s TriKen they create the all-powerful KishiRyuOh Three Knights! The DX KishiRyu can be purchased in a set for all Three Knights (priced at 7800 Yen) or separately (which would cost 2600 Yen apiece for Blue & Pink; 5200 Yen for Red). All are currently scheduled for release in March 2019! Stay tuned to TokuNation for all RyuSoulger reveals! 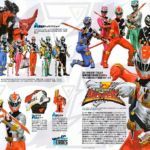 Kishiryu Sentai RyuSoulger- New Magazine Scans Released! The first proper round of magazine scans for the 43rd Super Sentai Series has finally been released, giving us the best look yet at Kishiryu Sentai RyuSoulger! *Ryusoul Blue is The Wise Knight who thinks twice before making a single move. *Ryusoul Pink is The Robust Knight and the strongest member of the team. *Ryusoul Green is The Gale Knight who uses speedy attacks to win battles. *Ryusoul Black is The Majestic Knight referred to as having splendid techniques. But the most remarkable member of the RyuSoulger team is Tyramigo, Ryusoul Red’s personal Kishiryu partner. Tyramigo’s power is unlocked when he transforms into the Giant Mecha Knight, KishiRyuOh! Tyramigo gains extra powers from the other Kishiryus shown combining with Ryusoul Blue’s TriKen and Ryusoul Pink’s Ankylose to form KishiRyuOh Three Knights! While the RyuSoulgers can use RyuSouls to power their weapons and attacks, they will confront enemies using a corrupted form of this ability called MinuSouls. In these scans, the RyuSoulgers are shown fighting off a squadron of enemy soldiers- known as the Dorun. The RyuSoulgers are scheduled to make their first appearance in the Super Sentai Strongest Battle event, and the series itself is currently scheduled to begin on March 17 2019! Stay tuned to TokuNation as we keep you up to date on all RyuSoulger reveals! All times are GMT -4. The time now is 5:52 AM.